Take a look at the upper-left segment in the image below. Here are some of the purchase dynamics. 1.67 Online Orders Last Year. 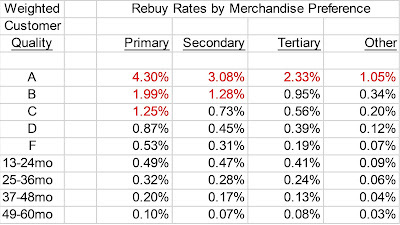 0.18 Retail Purchases Last Year. 8.3 to 1 Visit-To-Purchase Ratio. Average Price Point Of Items Purchased Last Year = $93. Now look at the advertising channels this customer uses. Affiliates, Natural Search, Paid Search, Referrals. 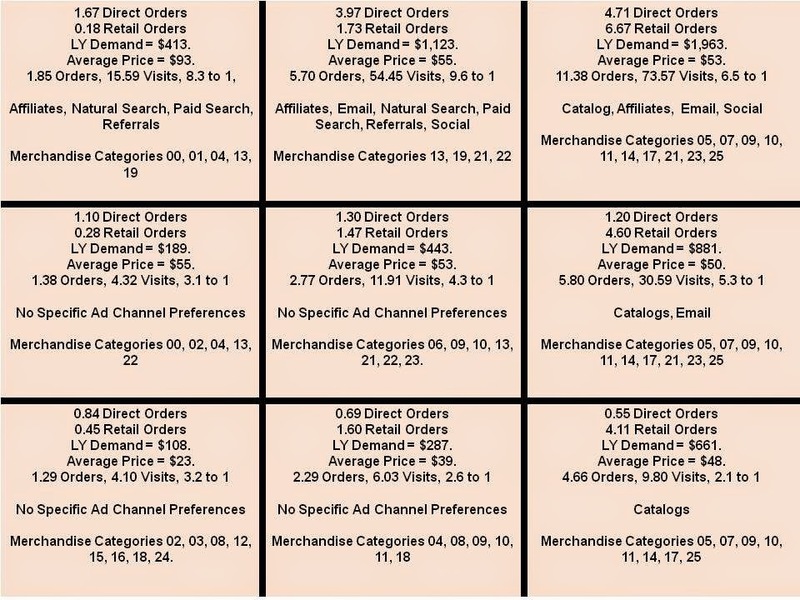 We have a customer who primarily shops online, who visits 8 times for every purchase s/he makes, who uses all sorts of shopping comparison advertising channels, who uses affiliates to get deals, and then purchases the most expensive items of any customer segment in the analysis. This may be a segment where the omnichannel playbook is valid. In fact, when you look across the top row of the table, these are all customers who fully utilize the omnichannel playbook. In this case, we have a segment of customers who are clearly looking to save money on the most expensive items the brand has to offer. Also notice that the merchandise categories purchased by the customer are different than are the merchandise categories purchased by other segments. This is a customer segment that, in many ways, is different from the rest of the business. 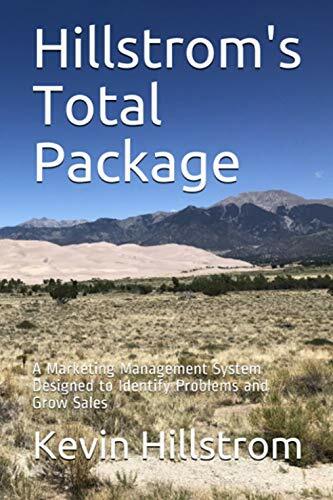 This is a marketing-driven customer segment, not an organic brand-centric segment who loves the general merchandise assortment. Recognize this customer. Realize that this customer is going to visit the website, often (8 visits to 1 purchase). Find ways to communicate to this customer that your pricing is fair.